Many readers / blogging friends thought I have travelled everywhere. The truth is that the more you travelled, the more you realize that there are many places that you haven’t visited. HuangShan in China is a place where I have never visited. My classmate in Chinese Calligraphy, Mr. Chung Kwok Fan, was there just last week. The photos he showed us were some of the best I have ever seen of HuangShan. Basically, he was several thousand feet above sea level and viewing down the clouds and mountains below him. It was just like a Chinese painting! Not just any painting, but a painting by a master. The view is just surreal. Mr. Chung has kindly agreed to my posting of this great photo. Do you think this image warrant submitting to the National Geographic? Huangshan ( literally: “Yellow Mountain”), is a mountain range in southern Anhui province in eastern China. The range is composed of material that was uplifted from an ancient sea during the Mesozoic era, 100 million years ago. The mountains themselves were carved by glaciers during the Quaternary. Vegetation on the range is thickest below 1,100 meters (3,600 ft), with trees growing up to the treeline at 1,800 meters (5,900 ft). Spellbinding. Yes, he should submit this to National Geographic’s My Shot. Hi, I will encourage my classmate to submit. Have a great weekend! Wow, so beautiful! The photo indeed should be in a major publication. Hi, thanks for the suggestion. I will leave it to my classmate to decide whether he wants to submit. Have a great weekend! Hi Brian, I would like to be there too, viewing it for hours! I think submitting it is an excellent idea. Each photograph cannot be repeated because each one captures a unique moment in time. It is worthy of being seen in print. Hi Ronovan, I will leave it to my classmate to decide whether he wants to submit. Have a great weekend! now that IS somewhere i have wanted to visit. amazing shot! I would like to see it in person too! You are right. Great image. Transcendent image. Before you submit it, I think that the rock face at the forefront should have more light and definition … find out HOW you submit and then at worst they will not accept it. But I think there may be a fee to be paid for submitting…Check their website. Cheers. V.
The pictures are definitely worthy of National Geographic. The terrain suggests a lot of seismic activity. The way the mountains are thrust upwards so violently implies to me they are not an old range of mountains, but probably very new? It would be nice to know the geological history of the area. Hi Leslie, yes, they are “new folded mountains”, but still they are old when compared with us humans! Yes I think he should try. No harm in trying. It is very beautiful. Hi bebs1, I will leave it to my classmate to decide whether he wants to submit. Have a great weekend! Wow – this is an impressive photo indeed! My congratulations and admiration to Mr Chung. Damn! That does look like a painting! I love it! Totally feel like I am floating on clouds. It sure must have been a surreal experience. A spectacular photo. And what would be lost in submitting it? They cannot say “yes” if they don’t see the photo! Quite true. I will leave it to my classmate to decide whether he wants to submit. Have a great weekend! I think you should definitely submit it, maybe even to a travel magazine. Absolutely beautiful! Hi, I will leave it to my classmate to decide whether he wants to submit. Have a great weekend! That is one of the most beautiful pictures I have ever seen ( except yours of the stone forest). National Geographic would do well to publish it. Your comment has prompted me searching through my stone forest photos to see whether there are other images that I should share! So beautiful! Yes, it is National Geographic-worthy, & I appreciate the information you shared. I travel the world through such blogs as this post. Thank you for sharing. I am also greatful to my classmate for his willingness to share! What an amazing scene in this photo by your friend! It looks like something from a science fiction movie – very special. Thanks for sharing. When I was young I didn’t know places like this exists until I came across paintings of Huangshan – they do look inspirational ! So mysterious and majical! Looks like a place that could have inspired the scenery for the movie Avatar. The place that inspired Avatar is Zhangjejia, this place seems more mystical! Glad that you enjoy Huangshan, Irene! The outstanding places are quite far away, requiring a lot of travelling time and money! I don’t believe it! Michael , this is the “must go” place if you haven’t. This was one of my early trips to china. Unforgettable ! I will write a post if I find my friend’s good pix. Mine are so so. Your friend’s pix is exceptionally beautiful! But you need to see the real Huang Shan! Problem is that my wife has been there. Whenever, we decide on a destination, we would like to choose a place where we both haven’t been – which is now getting more difficult! She doesn’t like to go to Huang Shan again? perhaps there are too many tourists there. it is too crowded. i also went to thousand islands. not that exciting. but huang shan is somethnig you cannot miss. indeed huangshan is not something that everyone can climb. Great photo, yes it should be shared with NG and that would be splendid! I will try to persuade my classmate and hope he would submit it! Yes, it is like entering into heaven! Would persuade my friend submitting. Have a great weekend! Yes, I need to go there before I am getting too old – needs to be physically very fit! Amazing shot! I am heading there in a few weeks time and would love to be able to capture something half as good as that photo. Hope you can still find the clouds which are there only in Spring! Stunning view – looks surreal. Surreal is the only word I can think of for this heavenly sight! This is quite a photo! Would love to know how he got up so high and what time of day and year this was. Great!!! Hi, this is in the morning and my friend has been hiking for a few hours! This one must go to NG! Hope to Huangshan in the future! Looks heavenly, glad you like it! Wow! Your friends photo is absolutely stunning. What a beautiful place! Hi, they are clouds but doesn’t matter, visually they are just similar here! It frees the spirit. Just like the master’s do in their ink and watercolors. Well said, the effects are similar! The more you travel the more you realize how much more there is to see…so very true sir. Beautiful picture! It’s one place that I really want to visit. Maybe someday… Thanks for sharing. it is a truly extraordinary photo. You should go see it in person! I agree with all the NG comments. I do not see myself making such a trip, or visiting many of the places you photograph and share, so thank you for taking me to place I may never see. We have a different kind of magnificence in the USA, but I think it not the same as the geography in your area of the world. Thank you for reading my blog posts! You can see my photography is not up to your level. Please thank Mr. Chung for taking the photo and also for allowing you to post it! Stunning!! His photo is really stunning, I am glad that he allowed me to post it! Wonderful shot. Very painterly… ie it looks like a painting not a photograph which is a style I love. Please encourage him to submit it where ever he can. He would not be submitting anything to any competition, but has sent me photos on snow geese which I published here! Hi, I agree – it is the most beautiful part of China. Last week I visited the Chinese Garden here in Portland Oregon, they had bonsai in what looked like a miniature Huangshan, and I said “they need to use dry ice to make the clouds”. After viewing your friend’s magical photo I wish even more to see it myself some day. Send my congratulations to your friend for a marvelous picture. It’s truly beautiful! I made a very short trip to Beijing 2 weeks ago and was sorry I did not have time to see more of China’s natural vegetation. Thanks for sharing. Hope you will be able to Huangshan one day ! Wow, really incredible photos! Amazing view! Great to hear from you,glad that you like the image! Have seen many Chinese paintings similar to this one but did not believe sceneries like this did exist! This is astounding! It might well be one of Wang Chien’s landscapes, or even a Wu Li painting. Thank you for sharing! I am sure you are able to appreciated this scenery more if you have seen their paintings and vice versa too! Exactly! To me, your friend’s photo was was like the paintings I had seen had come to life. A stunning photo, indeed. Michael, this is breathtaking! I was recently in Hefei, but could not make it to Yellow Mountains. Thanks for sharing. Hope you will make it some other time! It is indeed a great photograph, which is more than worthy of being shown within a greater arena. I congratulate your friend on him achieving this remarkable view. Many thanks for your comment, I am glad to have shared it! shared on my Be With Beauty pinterest board http://www.pinterest.com/pin/147141112800647302/. That means also shared on Twitter and Facebooks. Beauty needs sharing. Thanks very much for the sharing! You are welcome. Thanks for visiting also! Hi Michael! 🙂 Thank you for visiting my site and liking my Singapore post. Hi, Karen, you are welcome! One of the places I didn’t make it to when I lived in China and regret that. Looks so beautiful. Hope you will make it up there some other time! It’s a great photo, and he should submit to the National Geographic, or any other such publication. He has indicated repeatedly that he wouldn’t want to submit. I think we should count ourself fortunate to have his photo posted here! Stunning. Amazing and beautiful. Yes, submit it to National Geographic. It’s a fantastic photograph. Thank you so much. Sorry, he still wouldn’t want to have it submitted. maybe, after seeing so many readers liking his photo, he may change his mind, hopefully! I think it should be. It’s intimidating. Huang Shan is the #1 site that my family and friends enjoyed so much. It is hard to believe that you have not been there! Save the best to the last! Thank you for dropping by my blog. Lovely picture, I have never got as far as China but I love the thought of it, and this picutre encapsulates all my dreams. Hope you will get to China one day! Without them, the images will have lost a lot of atmosphere! This is breath taking. Photography at its best! It is incredible, thank you! Your friend Mr. Chung has an artists eye as well as you! This is stunning, and I hope you submit it to National Geographic! I’m so glad I found your blog site. Hopefully these comments will change his mind..
Hi, Mr Chung has firmly decided not to participate in any competition. I am unable to talk him out and cannot submit it on his behalf. So, unfortunately, his works can only be seen through my blog! Michael this is a feast for my eyes, thank for this photo. Your words say it all except where can I see more of his art? Your friend in calligraphy has kept the magic seen in a Chinese ink painting. An art form I admire and so enjoy. I have posted 3 photos on Huangshan, I am left with only one more which I will post in due course. Breathtaking and monumental picture from so high up! Glad that you like the image, thank you! Hi, thanks for liking my post. Stunning photo, Michael. I have been to Huangshan, and getting a clear shot like that is usually not possible. My photos sadly did not come out well. Glad that you like the photos! Many thanks for the encouragement, will keep it up! Mr Chung should definitely submit to national geographic! 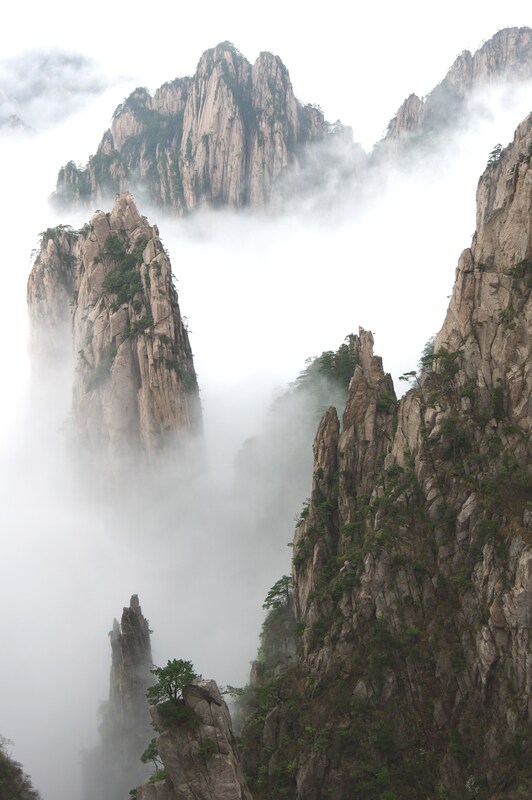 Stunning photo.. just out of the book Capital of Heaven i have of Huang Shan photos! I have never made it to Huang Shan yet either….. and its just down the road from Suzhou! He has refused after repeated persuasion, hope you will make to Huang Shan soon! Your photos are absolutely wonderful to look at, serene and peaceful! You have to visit there several times in a year or to fly there when you overheard there is a sea of clouds in the area. 🙂 Sea of clouds…sounds like a place out of my dreams! There is another post which gives you a collage of photos with clouds at Huangshan and also Zhanjiajie! I stumbled upon a blog today and I feel addicted already!! Many thanks for reblogging this on! “Just, wordless”…It looks surreal, but it is real….”Soothes out new vitality from the seeds of greatness in scripted on our soul, pushing up, for new DNA upgraded versions” …looks unreal…., but it is really real……,and suddenly…, the “Amazing Grace” beautiful melody inundated the brain area of my ears, laying out some unhidden meaningful words, and unfolding analogies …,and my whole spiritual body bended to the floor over my knees…..the wave kept pulsing, with a smooth flight into my queue of memories, and fraises came out honoring the “Amazing View” ……. It is said by neuroscientist: …..”more connections mean more effective learning”….so…besides all the stimulations on visual, speech, hearing and movement areas of the Brain, there goes the electric pulse, touching yet many zones….,and as always I have to introduce more people……, to “my precious treasure, “Box of Chinese wisdom cookies”…, and look what they say “this time”:….”The real meaning of enlightenment is to gaze with undimmed eyes on all undimmed”…., and another one of them says:…”Real is all a vision. You have to see it for yourself”. Thank You Mr. Lai, again, and for your friend Mr. Chung’s incredible ability on capturing the perfect angle for this suggestive “Photo”. “Thank You”. Was a mystical, a spiritual experience. The photo is a pretty good one, so I took advantages of it, and just thought that was standing in front of it, and couldn’t avoid “the reverence” I felt to the greatness of God’s “creation”. Well, may be was not very accurate to “say” that was completely mystical, but may be several levels before that some when closer one day, ha!…ha!. And , yes, I think that many of my friend, would like to see your site. Thank you for it. Absolutely stunning photography, Micheal. Your friend Mr Chung has a wonderful eye, and what a marvellous place to have visited. It seems to have a strong spirit and presence. The mountains just seem to be floating above the clouds! I am glad that Mr Chung passed me the photos! Such a classic scene – definitely worthy of National Geographic (I’d love to have it as wallpaper on my computer! *smile*). Thank you for sharing. Well, you can have it on your computer as wall paper! Wonderful post, we didn’t get to honfcun. Michael I went there when I was living in Beijing and it was a magnificent place; your photos are really good. I like the style of your presentation and your photos too! Thank you so much Michael. This is really kind of you to post your really lovely comment. You have made my day. That photo is breathtakinly beautiful. Hope you will see it in person soon! Trust you will enjoy your stay in the Philippines! Yes Michael, that is my hometown 🙂 have you been there? Not yet, I hope I can visit there one day.